The Sniper's Cheekpiece was originally designed by a physiotherapist and several gun specialists and is made from a combination of high density shock resistant foam and water resistant diving grade Neoprene. 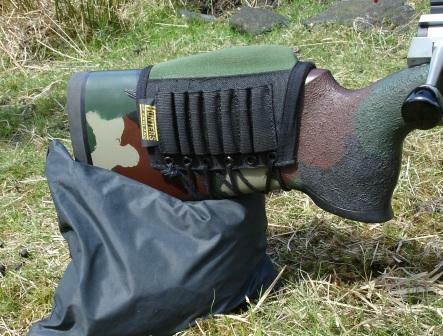 The pad contains two specially shaped “patented” inserts that when correctly fitted to the stock will make contact and cradle the cheek and jaw of the shooter, both inserts are angled from front to back so moving the pad forward or backward along the comb of the rifle will raise the eye line above the axis of the bore to aid in the use of optical devices (scopes) and night-vision equipment and make shooting any rifle (especially heavy magnums) more comfortable. Most rifles and shotguns are still designed on iron sights yet 95% of shooters now use a telescopic sight that raises the eye line some 1.5 inches above the average gun which in effect destroys any consistency in your shooting. Once correctly fitted, the Cheekpiece will ensure every time you shoulder your rifle it will come to the same position every time you shoot! This will speed up target acquisition and be muc h more comfortable to shoot! After all, your gun may be 'box standard' but all humans are different!